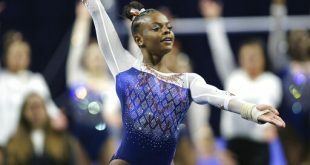 The top-ranked Gator gymnastics team returns home tonight to face SEC foe Kentucky in the O’Connell Center. 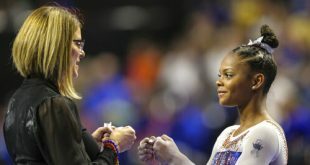 In Florida’s last meet at Georgia, history was made. Since 1992, Florida is the only team to bring a No. 1 ranking into Georgia’s Stegeman Coliseum and come out with a win. 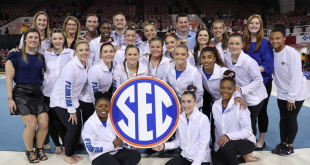 The GymDogs were leading by 0.150 going into the third rotation last Saturday, but three falls on the beam for Georgia put the Gators ahead for good. 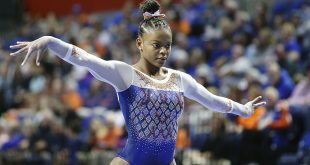 Florida took the win 197.30-196.175 in a tough, sold out arena. Gators coach Rhonda Faehn talked about what the biggest takeaway was for the team. Freshman Bridget Sloan claimed her third consecutive all-around title with a 39.60. All-Americans Kytra Hunter and Ashanée Dickerson were right behind her with scores of 39.45 and 39.40, respectively. Sloan also equaled her collegiate-best of 9.95 on uneven bars to share that event title. Junior Mackenzie Caquatto said performing well in the face of a hostile atmosphere will help the team going into the postseason. Meanwhile No.23 Kentucky is coming off of a 195.25-194.925 win over Missouri in its annual “pink” meet last weekend. The Wildcats’ highest score this season came in a tie against Georgia, where they posted a 195.825. The Gators’ highest season total is the 198.10 they posted against Alabama, which still stands as the nation’s highest score this year. Faehn said although Florida has found success this year, there are still areas that need improvement. Junior Alaina Johnson has been out most of the season resting her back, and new faces have been put in the rotation lineups to compensate for injuries and to rest athletes. 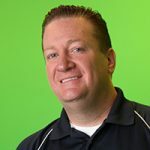 While Faehn says a “championship lineup” has not been put together yet, Caquatto talked about what the team is focusing on in practice in order to get a spot in competition. In Friday night’s matchup, fans are encouraged to “orange out” the O’Dome to contrast Kentucky’s blue. 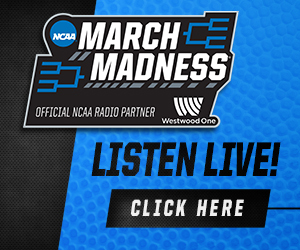 The meet will air tape-delayed on CSS at 9 p.m. Monday, and on CST at 1 p.m. on Feb. 28. The meet is set to start at 7 p.m.